Last week we covered the need for personal evangelism. You can read that at THIS LINK There are many people who are unwilling to come to Jesus themselves, and so we must bring Jesus to them in hope that they will accept His Gospel. We ended with the question "Who do you know of that needs Jesus, but is unwilling to come to Him, but you can bring Jesus to them?" All of scripture was written for our reproof, correction, training in righteousness, and so that we may be equipped for every good work (2 Timothy 3:17). Jesus also told us that every part of the Bible was written in order to teach us about Him and draw us to Himself so that we might have life (John 5:39). These verses tell us that if we are to be effective not only in our own walk with Jesus, but also in bringing others to Him, then we should be studying His Word and be immersing ourselves in its truth. By actively reading and studying the Bible you will be better equipped to share Jesus with others, because you will be filled with Him yourself. One of the greatest failures we can have is praying for others, while forgetting our own need. We should be going to God with our lack of faith, lack of boldness, and lack of sight to see opportunities all around us. By asking God to help us be sensitive to His Spirit and His guiding in our everyday lives, we will find ourselves in more opportunities to share His Gospel then ever before. We are reminding ourselves of their desperate situation which in turn causes us to care more for them and more actively look for opportunities to share the gospel. We are reminding ourselves that it is only by the grace and power of God that anyone will turn to Him and be saved. We are humbling ourselves before God which is required for anyone who desires to be used by Him. We are combating the spiritual forces of darkness. We must never forget that this is a spiritual battle and that those who don’t know Jesus have been spiritually blinded to Him. This battle can only be won by God’s grace through prayer - so we must begin all personal evangelism through this step of prayer for the lost. We don’t get to decide who will receive Jesus’ grace, but we can choose who we will bring Jesus to. As vague as it is, this is surprisingly more freeing than you’d expect at first glance. Rather than having a set description of the words to say, or the situations in which you can evangelize to someone, you get to simply be like Jesus to those around you. Another way to look at this is to imagine that you are in Bible times and you’re walking around with Jesus. Who would He talk to? Who would He reach out to? How would He do it? Pray for people. Do this right there on the spot. This will feel weird at first, but the more you do it the more you’ll be comfortable with it. So many people are thankful for prayer when they’re going through a rough time in life or they are struggling with something. Share your story. I don’t mean your entire life story (though you can if the situation lends itself). But if you’re living an active life with Jesus, there will be stories to tell. There will be situations that come up in your life that people will ask about. In these moments, you can share what’s going on in light of the fact that you have Jesus in your life. For example: you’re scared of an upcoming medical condition, but you can share how you have hope in Jesus. Or, you’re excited about a new opportunity that’s come up and you’re praying to Jesus for wisdom. Even stories of how Jesus has recently provided for or encouraged you are always great ones to share. Serve others. Whenever there’s a need in your circle of friends and family, do you offer to help? Jesus would. I don’t mean that we help in every situation, as we may not be well equipped to, but are you known as someone who would “give the shirt off their back” for another? Serving people the way Jesus does is one of the best ways to show His love and to open opportunities to share His Gospel with others. 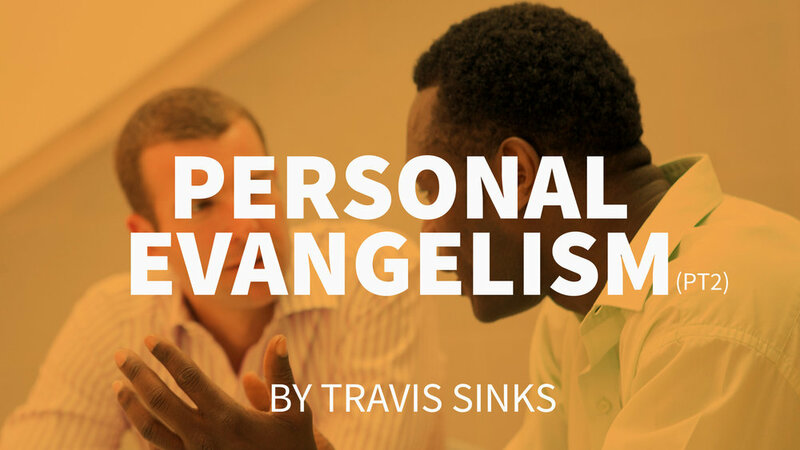 There are so many specific ways we can reach out to others in personal evangelism, but there’s one thing that stays the same: It’s personal. We cannot do personal evangelism as we are called to without getting into the nitty gritty of everyday life with others. This can, and will, be painful at times - but it’s always worth it. Am I in God’s Word on a daily basis? Am I praying for God’s Spirit to fill me? Am I praying for those I know who don’t know Jesus? Am I taking opportunities to do as Jesus would do? Maybe you haven’t been doing these things. But you can today. “It’s never the wrong time to do the right thing." So let’s go bring Jesus to everyone we see with today.